Karon, Silver, Foreword. Part I: Engaging the Patient. Garfield, Dorman, Strengthening the Patient. Faulconer, Silver, The Initial Engagement in the Psychotherapy of Psychosis, With and Without an Asylum. Prouty, Making Contact with the Chronically Regressed Patient. 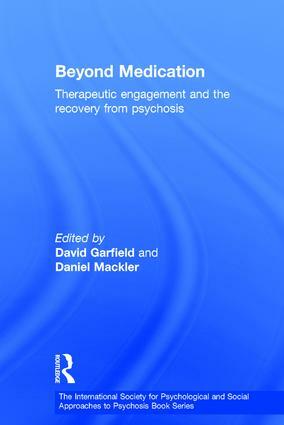 Schwartz, Summers, The Role of the Therapeutic Alliance in the Treatment of Seriously Disturbed Individuals. Part II: The Elements of Change. Summers, Sustaining Relationships: Cure, Care, and Recovery. Kipp, Sustaining Relationships in Milieu Treatment: A Corollary to Summers. Koehler, The Process of Therapeutic Change: Trauma, Dissociation, and Therapeutic Symbiosis. Gibbs, Technical Challenges in the Psychoanalytic Treatment of Psychotic Depression. Mackler, Practicing the "Impossible Profession" in Impossible Places. Part III: Listening to the Patient: Stories of What Really Works. Penney, Leaving Schizophrenia: The Returning Home of the Awakened Mind. Greenberg, Life in the Mines: A Retrospective on my Therapy. Foltz, The Experience of Being Medicated in Schizophrenia: A Subjective Inquiry and Implications for Psychotherapy. Part IV: Concluding Chapter. Steinman, Sustaining the Therapeutic Approach: Therapists May Need Help Too! David Garfield is Professor, Associate Chair and Director of Residency Training in the Department of Psychiatry and Behavioral Sciences at Rosalind Franklin University of Medicine and Science, Chicago Medical School. He is also faculty at the Institute for Psychoanalysis, Chicago. Daniel Mackler is a psychotherapist in private practice and a filmmaker, New York City.